Prime Minister Nguyen Xuan Phuc received Australian Senate President Scott Ryan in Hanoi on January 21, saying that Vietnam-Australia relations are now at the best level ever. Welcoming his guest’s official visit to Vietnam, PM Phuc expressed his belief that the trip will help consolidate the two countries’ strategic partnership as well as connections between the two parliaments. 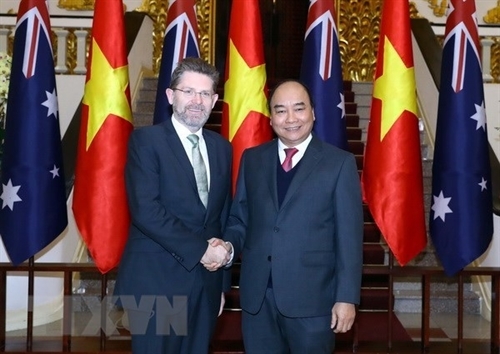 He said the Vietnamese Government will work closely with its Australian counterpart to realise the joint statement on the establishment of the strategic partnership. The two sides will effectively maintain existing cooperation mechanisms and promote the implementation of new ones within the framework of the strategic partnership, including meetings between their foreign ministers, defense ministers, and ministers in charge of economic affairs. Regarding measures to bring bilateral trade and investment on par with the strategic partnership, he said the countries should reduce and remove trade barriers, especially to agricultural and aquatic products like fresh fruit and shrimp, while facilitating activities of each other’s businesses. Vietnam and Australia should also enhance cooperation in education-training, culture, tourism, sports and people-to-people exchange, creating solid foundation for expanding ties across the board at both central and local levels. In particular, they need to strengthen labor cooperation, the PM said, suggesting them make use of the Comprehensive and Progressive Agreement for Trans-Pacific Partnership (CPTPP) to increase the quota for Vietnamese workers under the Work and Holiday Program, thus helping increase high-quality laborers for both countries. The Government leader appreciated Australia’s continued provision of official development assistance (ODA) for Vietnam, affirming that the ODA has always been used effectively and contributed to local development. PM Phuc also spoke highly of Australia’s defense ties with Vietnam, especially in training in English and peacekeeping activities. He particularly welcomed its assistance in transporting all equipment and servicemen of Vietnam to the United Nations peacekeeping mission in South Sudan. He asked Australia to keep cooperating with Vietnam to ensure national security through controlling and handling terrorist individuals or organizations who may take advantage of Australia’s territory to conduct sabotage activities against Vietnam. At the meeting, PM Phuc also hailed the two countries’ close coordination at regional and international forums, particularly the UN, the Association of Southeast Asian Nations (ASEAN) and the ASEAN-led mechanisms. He thanked Australia for helping Vietnam successfully organize the Asia-Pacific Economic Cooperation (APEC) Year 2017 and pledging to support the ASEAN nation’s candidacy for non-permanent membership at the UN Security Council for 2020-2021. In 2019, Vietnam will keep working with Australia to ensure the success of high-level regional meetings like the East Asia Summit, ASEAN-Australia meetings, and APEC meetings, he said, adding that as the seventh country to ratify the CPTPP, it will also cooperate strongly with Australia to implement this deal. In terms of the East Sea issue, the PM said Vietnam highly values and hopes that Australia will continue the strong voice and support for ASEAN and Vietnam’s stance on this regard. He called on Australia to promote the serious and full implementation of the Declaration on the Conduct of Parties in the East Sea and the early finalization of a legally binding Code of Conduct in the waters. He also expressed his hope for more support for Vietnam to improve its sea management capacity, build and carry out maritime policies, and train experts on the law of the sea. For his part, Australian Senate President Scott Ryan said his country pays special attention to the cooperation with Vietnam, noting he is happy that bilateral relations are developing strongly in all fields. More and more young Vietnamese have come to study in Australia, which reflects the increasingly solidified trust between the two countries, he said, noting that under the New Colombo Plan, 2,500 Australian lecturers and students will come to Vietnam, and they will be an important bridge and driving force for bilateral ties in public investment, innovation and education-training. Regarding the thriving parliamentary links, Ryan said he believes that these connections will develop even more comprehensively and strongly in the future. He added Australia always respects Vietnam’s proposals for enhancing bilateral ties. He also appreciated the Vietnamese Government’s support for the two countries’ relations and called for more concrete activities to promote partnerships, especially in trade. Both sides want a peaceful and stable region for sustainable economic growth, the President said, adding that his country always recognizes Vietnam’s efforts in this regard and UN peacekeeping activities, which shows Vietnam as a responsible member of the international community.